FILE - A man reads newspapers' headlines in central Athens, Aug. 21, 2018, as the country ended eight years of painful bailouts. On Monday, eurozone ministers delayed granting Greece debt relief because the government failed to implement reforms promised during the bailout. Eurozone ministers on Monday held back granting Greece debt relief because the government failed to implement reforms promised during the massive bailout that ended last year, officials said. Greece exited its third and final international bailout in August, a turning point in its progress out of the catastrophe that engulfed the country during the financial crisis. The Greek government has still failed to complete housing insolvency rules that have raised fears in Greece for families threatened with foreclosure on their homes. European officials, however, played down the delay, not wanting to rekindle memories of the eurozone debt crisis that nearly destroyed Europe's single currency. "It's too early to decide formally on the disbursement today," said EU Economics Affairs Commissioner Pierre Moscovici ahead of a Eurogroup meeting of eurozone finance ministers. FILE - European Commissioner for Economic and Financial Affairs Pierre Moscovici attends a news conference in Brussels, Belgium, Dec. 4, 2018. 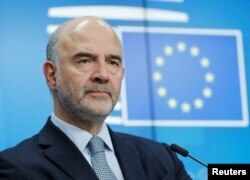 "The signal given to the markets is decisive, the message of today's Eurogroup will be and must be positive," he added. The debt relief measures are mainly profits made by the European Central Bank (ECB) and other EU central banks on Greek government bonds during the bailout period. Greece could receive just short of one billion euros from its eurozone partners in the debt relief scheme. The delay comes days after Greece issued a 10-year bond, the country's first since its 2010 debt crisis. The bond was hailed as a major milestone marking Greece's return to normalcy after almost a decade of being avoided by the markets. Growth is expected to reach 2.4 percent in 2019 after an estimated 2.1 percent in 2018, according to the latest International Monetary Fund (IMF) projections.